Lately, I’ve become obsessed with discovering new ways to amplify the things I already do. And when it comes to recipes? Supplements always come through. Of course, there’s nothing better than the most natural form of a nutrient. But supplements can really amp things up. 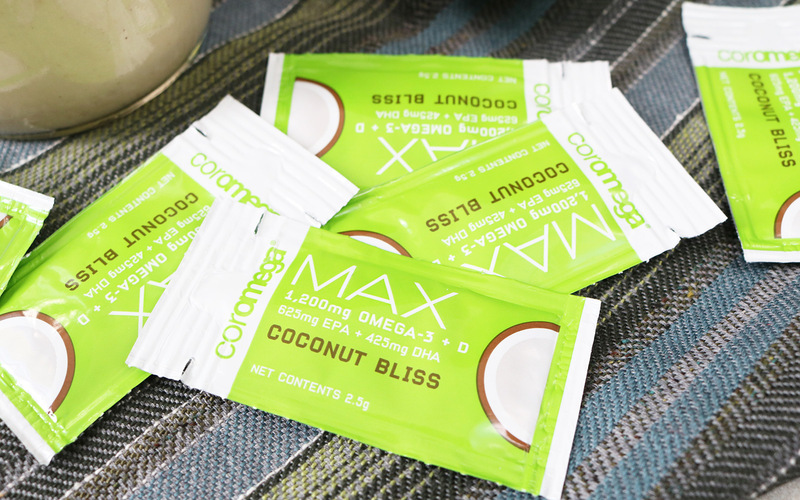 My latest experiment included Coromega Max Super High Omega-3 in Coconut Bliss – but more on that later. This obsession of mine has also filtered into cleaning and beauty products, too. For example, castile soap has become my new BFF. It can be made into an all-purpose cleaner that is perfect for every room. Talk about killing several birds with one stone. Plus, castile soap is amazing for DIY body wash, hand soap, and dish soap. I also recently made a DIY rose earl grey scrub that can be used for the body and face, as well as a mask. To me, the concept of making one thing with multiple purposes is just awesome. When I got the chance to test Coromega’s coconut-flavored omega-3 fish oil supplements, the wheels in my brain started turning. Tasty flavors and healthy goodness? I’m about it. I actually take fish oil gel supplements already, so I was stoked to try this alternative. My scheming resulted in this beauty: a coconut-flavored “cinnamon bun” smoothie, jam-packed with flavor and healthy fatty acids. Love love love. 1. 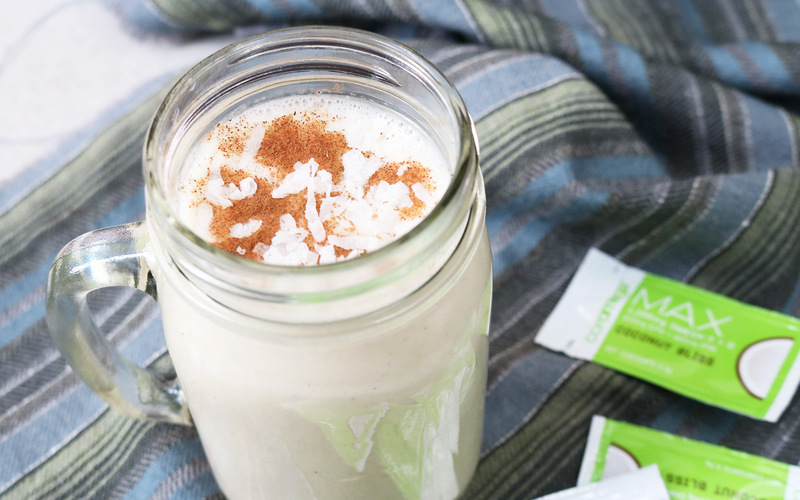 Place all ingredients (except extra cinnamon and shredded coconut) in a blender. 2. 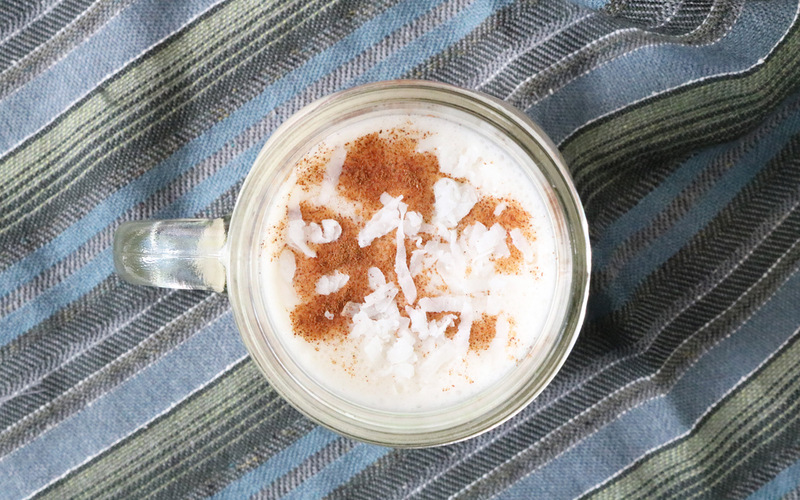 Top off with cinnamon and shredded coconut. Enjoy! One Coromega packet has 1,200 mg of omega-3. (In pill form, most fish oil supplements have about 300 to 600 mg.) It also has vitamin D3, which the body creates from exposure to sunlight. This is exactly why it’s nicknamed the “sunshine vitamin”! Together, omega-3 and vitamin D3 ward off heart disease like the bosses they are. Personally, I also notice skin improvements when I fuel up on omega-3. Score. To learn more about Coromega Max Omega-3 Fish Oil supplements in Coconut Bliss, head on over to Coromega. They also have a Citrus Burst version, too. PS: As always, check with your doctor before adding any kind of supplement to your diet. FTC Disclaimer: Coromega Max Super-High Omega-3 Fish Oil supplements were provided by Coromega and RKPR Public Relations. All thoughts and opinions are my own; I only collaborate with and feature companies that I truly support. Thank you, Coromega!